Today we’re taking a closer look at why adding a steel building to your property this fall is a great idea. As grass and landscaping begin to go dormant for the year, it’s time to find a place to keep your lawn mowers and gardening tools. If you don’t have covered storage space, this may mean just throwing a tarp over your machinery and hauling your tools into your basement. This is not ideal, of course. Freezing temperatures coupled with exposure to harsh weather can severely shorten lifespans of mowers and other powered lawn care equipment. And storing dirty tools indoors can make extra messes you have to deal with. 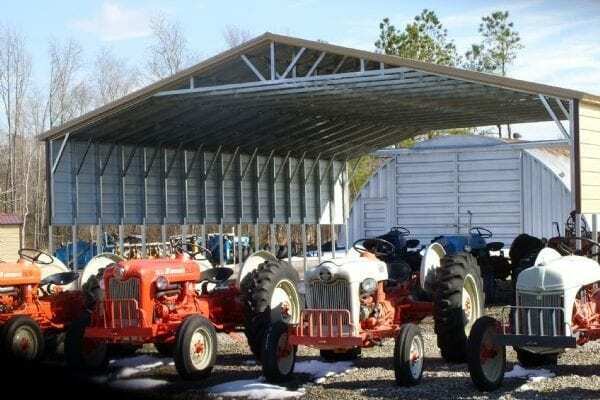 This year, consider building either open-air covered storage, such as a protective carport, or a secure, enclosed space like a new garage building or barn. Both options provide strong protection that could help keep equipment and tools in good working order longer, which ultimately saves you money on maintenance, repairs, and replacements. As the season of summer fun with your recreational vehicles comes to a close, you’re probably thinking about winterizing and storing these “big toys.” Parking these vehicles outside under a tree or in your driveway likely means that you’ll have to spend time extensively cleaning and washing when spring rolls around again. This can be avoided with convenient RV and boat storage buildings! Fabric covers only offer so much protection against ice and snow, and they often shred or even blow away in particularly windy conditions. Don’t waste your money buying yet another cover when you can invest in a safer solution that’s perfectly sized to fit all of your vehicles, from jet skis to RVs. Do unpredictable snow and ice storms frequently make you late for work or important events during the winter? If you don’t have covered parking for your car, you know the time needed to clear accumulated snow, ice, or even frost on windows can be extremely inconvenient at best. With a garage or even a simple carport, you can save yourself some scraping and snow removal work. Stay inside your home for a few extra minutes on frigid mornings when your vehicle is parked safely out of the elements! If you’ve been dreaming of adding a garage to your property for years, but think that it’s just not within your budget, we invite you to look again. Pre-priced garages are available to our customers throughout much of the Eastern US. Beyond their affordability, these stock kit structures can be built quickly – in days as opposed to weeks or months required for frame buildings. This means you can easily beat the winter weather by beginning your building project during the fall season! Garages are available in a variety of sizes, are fully enclosed on all 4 sides, and even include one or two doors (depending upon overall size). In addition to creating a protective parking area for vehicles and winter storage for yard maintenance gear, fully enclosed buildings (but also carports to a lesser extent) can help you organize your entire property, and your life. But how do you get set up for ultimate storage efficiency and ease of use in your new building? After all, you don’t want to clutter up the area and be out of space again before you know it. Plus, you also want to assure that items are accessible. Here are a few tips to make living with your new structure a dream come true. Even if you’re mainly planning to use your structure for parking your regular everyday vehicle, adding shelving units throughout the space gives you convenient storage for automotive items like car wash supplies and tools. You’ll be surprised to discover how many other outdoor-use items you can keep on these shelves as well, where they’re visible and easy to grab. Think winter décor items like Christmas lights and wreaths, ice melt for the driveway, and your kids’ sleds. Without shelves, these items will likely be piled on the floor, and you may find yourself with less and less space for your car over time! While you may not be using your structure specifically as a workshop, there are advantages to creating a workbench within the space. You can’t go wrong with having a work surface available to make small repairs to outdoor items or do other tasks that require a stable, raised surface. You may also find that a workbench gives you the perfect place to set up bins and small drawer storage units to hold loose hardware and other small items you don’t want to lose. Leaving open floor space in your structure is important for safety and accessibility. If you’ve added shelving and a workbench to the space, this will likely help you avoid storing everything on the floor, which is inefficient. But, also consider that you need room to open car doors, hoods, and trunks. And you also need room to walk and move around! One way to create open floor space is to build your structure with multiple doors, which creates more potential pathways than if you simply have one overhead garage door built in. For larger structures especially, we recommend considering the addition of multiple overhead doors, as well as at least one walk-in door. As you get ready for another winter, take the worry out of trying to find safe storage locations for all of your valuable warm season gear. Trust the experts at Newmart Builders to help you build durable, property-enhancing options you may have never dreamed were possible. Whether you want to build your own structure, or you would rather leave construction to the professionals, we’re here for you every step of the way. Get in touch today to talk about how we can make this winter easier for you and your prized possessions.